For the past couple of nights, while plowing through the codebase, I've been working on a plugin that allows you to communicate with servers through JSON with pure Blueprint nodes! Since I figured it could be helpful to at least some of you, I'm sharing the complete package! *NOTE: If you can't see the JSON category or nodes, be sure to turn off "Context Sensitive"
If you guys have any comments, feature requests or improvements, please don't hesitate to ask. Lastly, I just want to give a shoutout to Rama for being a big help with his tutorials, if you're reading this, cheers buddy, you're awesome! Last edited by Stefander; 11-19-2018, 04:27 AM. Seems like a great plugin! While I don't have any use for it now, I definitely see potential for the future. Oh yeah. That's fantastic. I am so happy with the UE4 community being so generous with their code. This is exactly what I needed to prove a concept Cheers! Denny: Cheers, thanks for the reply! Tom: Cheers bro, your support is greatly appreciated, let me know if you need any help! iMuse: Thanks man, graag gedaan! Sorry for the confusion, let me know if that helps, I'll add this example to my first post as well! Last edited by Stefander; 05-26-2014, 04:55 PM. very sweet plugin! I really can't wait for the marketplace and many of these little plugins are incorporated. Its one of those things i would much prefer to prototype in blueprints and then go back and rewrite important things in C++. But even something like this, assuming its not time critical/looping multiple times i wouldn't even rewrite it! (say for just pulling update news or something like that). One note though - You shouldn't need the Intermediate directory in your rar. By including the source those libraries and such are generated when building your plugin into a given project. KRushin: Cheers man, if you stumble across any issues be sure to let me know! 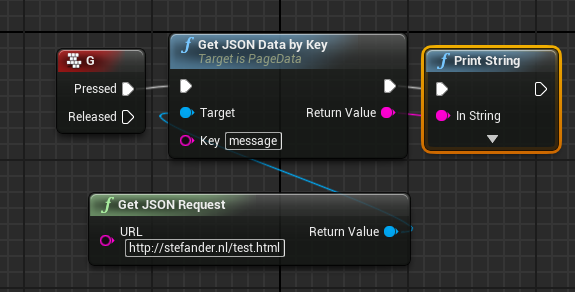 At my current company we mainly use JSON to communicate with our servers, so I figured it'd make sense to start my Unreal 4 journey with this little plugin! I'm planning to integrate nested keys as well in a few days, as well as XML support, to make it a little more flexible! Bob: No worries, I'd love that! I'll put it up later today, cheers! Xces: Glad you like it, it's my very first contribution! I'm very grateful for all these kind comments, thanks everyone, I'll be releasing more stuff soon! one quick question: does it works with JSONArrays ? if yes how ? And how safe is it against hacking? Will we see this updated for 4.2.1? It says it's not compatible?